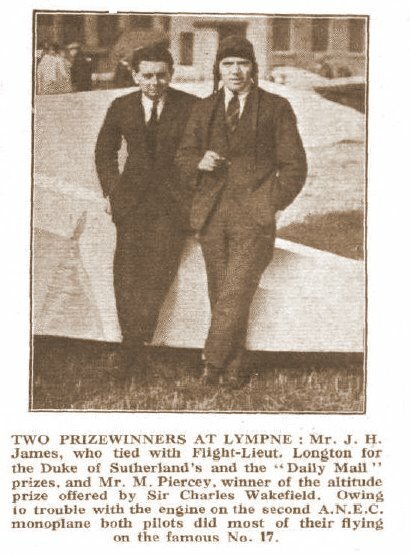 In October 1923 the first aviation race meeting for light aircraft (1 seater planes) was organised by the RAeC (Royal Aero Club) at Lympne Airfield, under the Chairmanship of the Duke of Sutherland and in conjunction with sponsorship by the Daily Mail Newspaper. There was a lot of prize money at stake, Sutherland had offered 500 pouns, and the Daily Mail offered 1000 pounds, for the greatest distance covered on 1 gallon of fuel. The Abdulla prize was 500 pounds for the fasted speed round two laps of the course. Open to anyone. Sir Charles Wakefield offered a 200 pounds prize for attaining the greatest altitude. Open to anyone. The society of Motor Manufacturers and Traders offered a prize for the greatest number of laps of the circuit over the course of the meeting. This prize fund was matched by The British Cycle and Motorcycle Manufacturers and Traders Union. Guardian and in aviation magazines of the time. an amazing 87.5 miles per gallon. Mr. W.S. Shackleton. 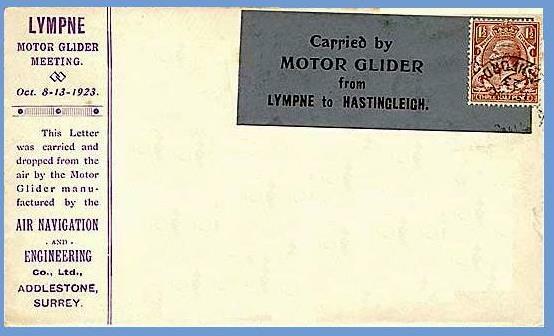 According to the great nephew of Mr Blundell who contacted this website, when the Daily Mail announced the competition for motor gliders with a 1000 pounds prize, Mr. Blundell and Mr Shackleton corresponded about altering the plans to convert the glider design in to a motor glider. The aircraft was made of wood, with a 696cc motorcycle engine (The Blackburne Tomtit), which had been modified and thus ANEC 1 was the first aircraft to fly in the United Kingdom, with an inverted engine. Its aircraft number was G-EBHR and it was built at Addleston in Surrey by ANEC (Air Navigation and Engineering Company) and transported by road to Brooklands in Surrey where it first flew on the 21st August 1923. ANEC 1 (G-EBHR) was then sold in August 1924 and shipped to Australia. There were only three ANEC 1 aircraft ever built, it was 15 ft 7 inches long, and had a wingspan of 32 feet. Two of them took part in the 1923 Races at Lympne. Entrant Numbers 17. and 18. 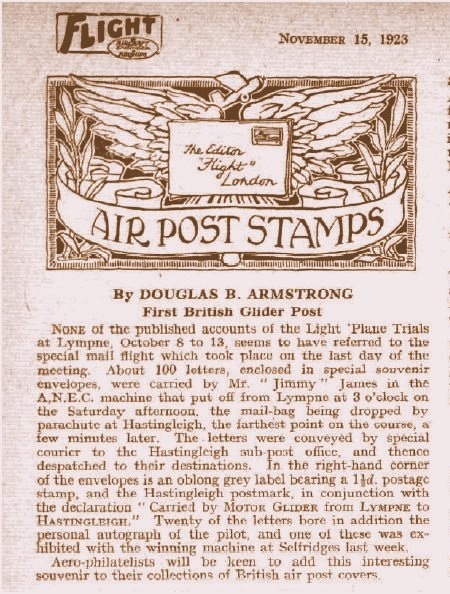 On 13th October 1923, Hastingleigh earned its place in Aviation and Postal history. On the last day of the aero-race meeting, a special event was organised. 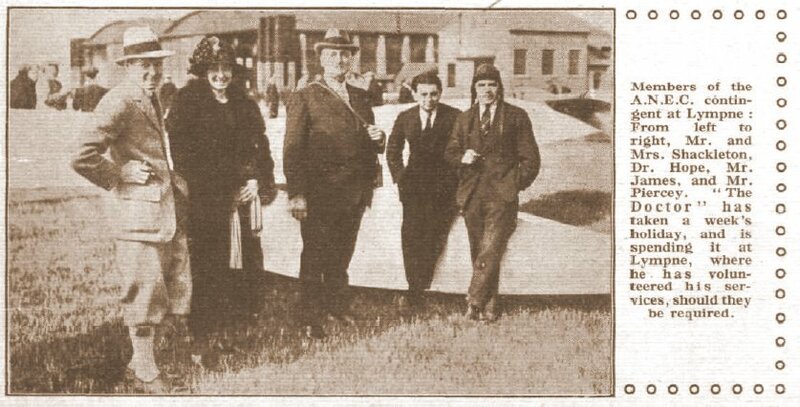 The world's first Motor Glider Mail Flight. 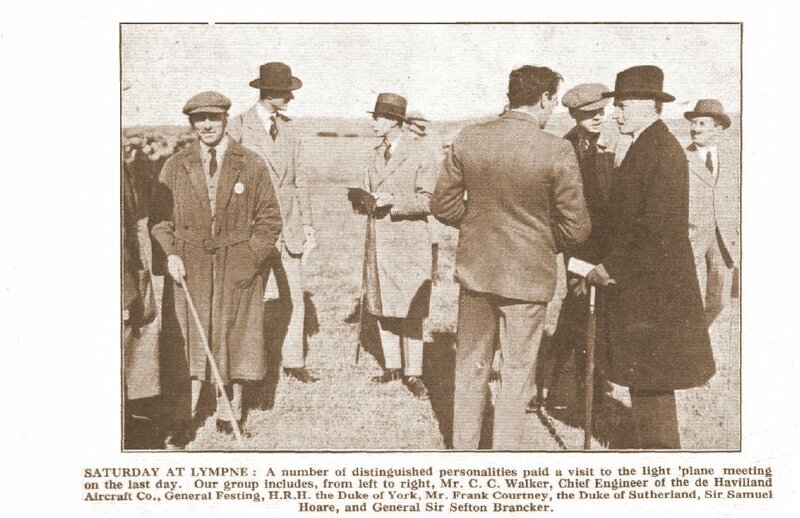 The Duke of York (later to be King George VI) was in attendance along side many other British and Foreign dignitaries. 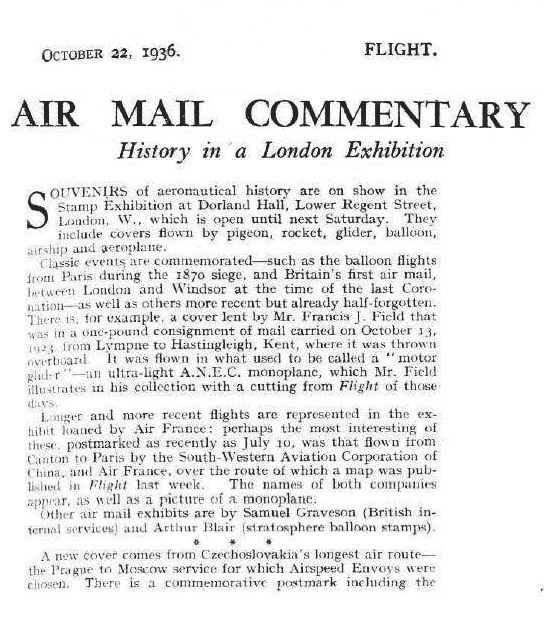 As a publicity stunt for the ANEC company, the winning aircraft ANEC 1, carried a mail bag parcel containing just over 100 special edition envelopes as it took off from Lympne at 3pm, piloted by Jimmy Herbert James. 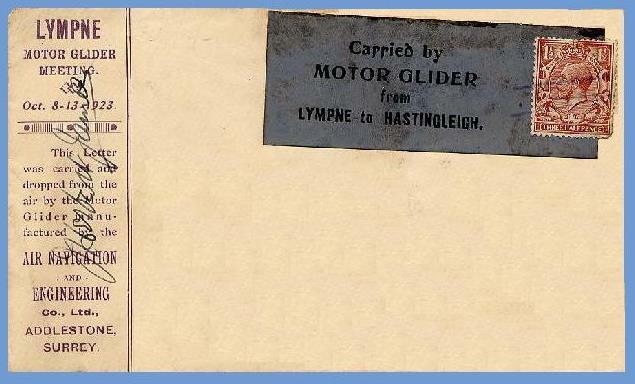 The monoplane flew up over Hastingleigh village, and Jimmy threw the package overboard to parachute to the ground. It was recovered by special courier who took the parcel up to the Post Office at Tappenden's Store; the mail was duly franked and sent on its way. These envelopes, 20 of which were signed by the pilot (- see right hand image below) do turn up from time to time at auction, and are quite costly to acquire. They have certainly increased in value since the occasion of their first flight, when the stamp cost just a penny - ha'penny. greatest height competition and claim the 200 pounds prize. "On landing, Mr Piercey, who may be assumed to have been numbed from the intense cold at the great height at which he had been flying, over shot the mark somewhat, and was still going at fairly high speed on the ground when approaching the enclosures. Captain Rogers, a representative of the British Petroleum Company, flung himself against one of the wings of the machine, thus causing it to swerve. In doing so he was winded and bruised, but he prevented the machine from running in to railings. Instead it collided with the tailplane of the deHavilland No.8, which was damaged. The wing tip of the ANEC also suffered somewhat, and a final attempt by (Jimmy Herbert) James to beat Macmillans speed figure had to be abandoned." Sadly in the attempts to win the altitude prize, the world record breaking French pilot Alexis Maneyrol (26 Aug 1891- 23 Oct 1923) was killed when his aircraft buckled in-flight and crashed. As a result of this tragedy, the closing ceremony banquet, due to be held at Hythe, was called off as a mark of respect. times by Alison Blundell, who had been a pilot in 1917 / 1918.
was quite badly injured in the crash. of a Royal Naval Ship:-HMS Furious. Seven Sopwith Camels sailed over to within striking distance of the Zeppelin sheds. For the story of the Tondern raid (click here), earning his second DSO. He had only qualified as a pilot 24 July 1916 aged 24.
were struggling with soggy wings. for WW2, the 25th anniversary event took place in 1948. Many of historys most famous early pioneer aviators took part in these races over the years. Bert Hinkler who managed 80 trips in 5 days winning 300 pounds for his efforts. In August 1925, the world famous long distance aviator Sir Alan J. Cobham, brought his "Cobham's Flying Circus" to Lympne, and during one race he crashed his aircraft in Hastingleigh. You can read about the Lympne meeting and the crash on the first of the following newspaper articles. 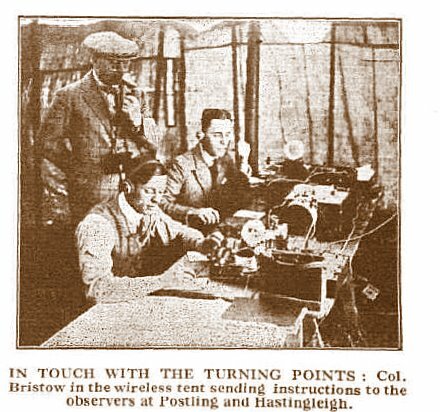 The second article dating from 1934 , mentions a pylon at Hastingleigh which was used as a pilot's visual aid for the turning point of the triangular races. This was not an electricty pylon - as electricity didn't arrive in the village till the mid 1950s, and was more likely a pylon built specifically for the races, as illustrated in the poster for Cobham's Flying Circus, shown below the second article. calculated feat of trick flying, Capt F.T. attended to-day's meeting for Mr. Alan J.
see what assistance was required. buted by Jimmie James, whose A.N.E.C. him from the tiny cockpit.